Copic Sketch Marker Set 72B Papercrafting Color S72BSTAMP BRAND NEW. Our papercrafting sets include colors specifically selected for their popularity with paper crafters, scrapbookers and stampers. Packaged in a clear plastic case, a Sketch set is the ideal way to begin or add to a marker collection. This set contains the following colors: C1, W5, B12, B14, B18, B21, B26, B29, B34, B41, BG02, BG13, BG18, BG32, BG45, BG99, BV31, E02, E07, E09, E13, E15, E19, E21, E25, E39, E51, E53, E57, E59, G00, G05, G12, G14, G19, G24, G82, R00, R05, R11, R17, R24, R27, R39, RV09, RV10, RV11, RV17, RV19, RV25, RV29, RV32, Y00, Y08, Y13, Y17, Y19, Y23, Y26, YG01, YG05, YG07, YG13, YG17, YG45, YG95, YG99, YR14, YR16, YR18, YR21, YR23. Please familiarize yourself with our Terms & Conditions. 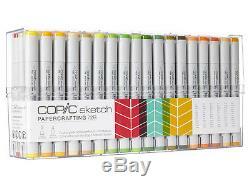 The item "Copic Sketch Marker Set 72B Papercrafting Color S72BSTAMP BRAND NEW" is in sale since Saturday, August 01, 2015. This item is in the category "Crafts\Art Supplies\Drawing\Pens & Markers". The seller is "icopic" and is located in Fountain Valley, California. This item can be shipped worldwide.